Postcard of three views of the Austro-Hungarian fortress city of Przemyśl - panorama, Ringplatz, and Mickiewiczgasse. Message K.u.K. 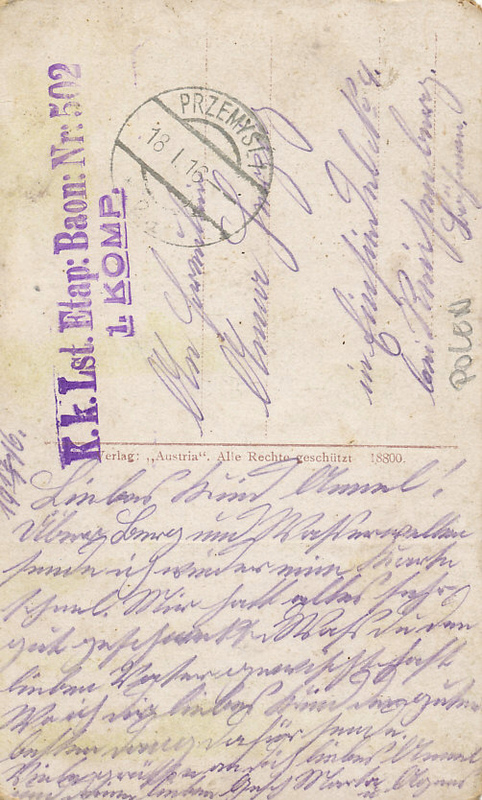 fieldmarked Przemyśl, January 18, 1916. Przemyśl was the greatest of the Austro-Hungarian fortresses, and key to the empire's defense of Galicia. First besieged by Russian forces in September 1914 during the Galician Battles, the siege was temporarily relieved during Germany's and Austria-Hungary's October offensive. Under General Alexsei Brusilov, the Russians resumed the siege in October. On the San River, Przemyśl, like the Belgian fortresses of Liège and Antwerp, was protected by a ring of forts. 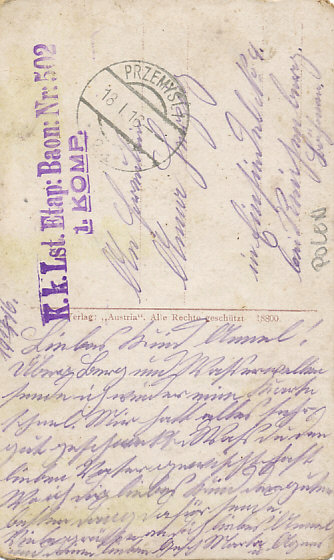 Over 125,000 Austro-Hungarian soldiers defended the fortress. Russia did not possess the kind of heavy artillery with which Germany reduced the Belgian forts, and the siege continued to March 1915. The Austro-Hungarian Third Army attempted to relieve the city, attacking through the mountains. Heavy snow, bitter cold, wolves, Russians, and despair took a heavy toll, and reduced the life expectancy of the relief forces to five or six weeks. Temperatures fell as low as -13 Fahrenheit (-25 Celsius) freezing the men, their food, and the ground into which they needed to entrench for their defense. 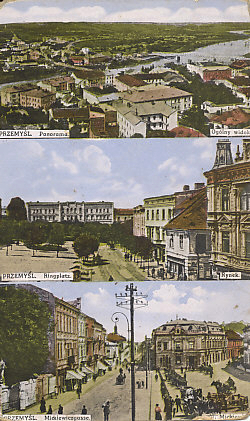 The Third Army lost 89,000 men in trying to relieve Przemyśl. The Austro-Hungarian Second Army began its attempt to reach the fortress on March 1, 1915, attacking in fog and snow, and suffering 51,000 casualties. Within the fortress, conditions worsened. On March 19, the Austro-Hungarians attempted to break out through the Russian lines, but a Russian counterattack drove them back. Later the same day, the defenders began burning documents and currency. On March 21, the commander ordered the butchering of horses for food, and, on the 22nd, the destruction of train facilities, guns, and defensive works. On March 23, 1915, the fortress surrendered with 117,000 men, 2,500 officers, and 93 senior staff officers taken prisoner.